ORLANDO, Fla. – The suspect in the fatal shooting of an Orlando police officer was captured Tuesday night after eluding a massive manhunt for more than a week, authorities said. Orlando police Chief John Mina said Markeith Loyd, 41, was flushed out of an abandoned house and taken into custody, ending a manhunt that began with the Jan. 9 killing of Lt. Debra Clayton outside a Wal-Mart store. Local television stations showed Loyd with a bloodied face as a half-dozen officers and deputies took him into police headquarters. Loyd was wearing body armor and carrying two handguns – one equipped with a 100-round magazine – when he surrendered after a SWAT team surrounded the house in western Orlando, Mina said at a news conference. He said Loyd resisted arrest and had some facial injuries that were being treated. Mina denied rumors that the arrest was the result of an anonymous tip, saying that Loyd was captured by the tireless efforts of law enforcement. Before the officer’s shooting, authorities had been looking for Loyd for questioning in the death of his pregnant ex-girlfriend, Sade Dixon. Clayton had been tipped off that he was in the area while she was at the store and was shot when she approached Loyd, who then fled. Orange County Sheriff Jerry Demings said at the news conference that the arrest is bittersweet, noting that in addition to Clayton, a deputy in his agency, Norman Lewis, died in a traffic crash during the manhunt for Loyd. Demings said Loyd would be charged with two counts of first-degree murder in Dixon’s death last month. Loyd will also face one count of attempted first-degree murder and two counts of aggravated assault with a firearm related to the shooting of Dixon’s brother and threats against other relatives. Police arrested a former supervisor at the fried chicken restaurant where Loyd worked, an ex-girlfriend and a niece last Tuesday and Wednesday on charges of helping him in the weeks after Loyd’s ex-girlfriend was fatally shot. Mina said he expects more arrests in the case for anyone who helped him evade police. He said authorities didn’t know how long Loyd been in the house, which was abandoned but does have ties to associates of his. 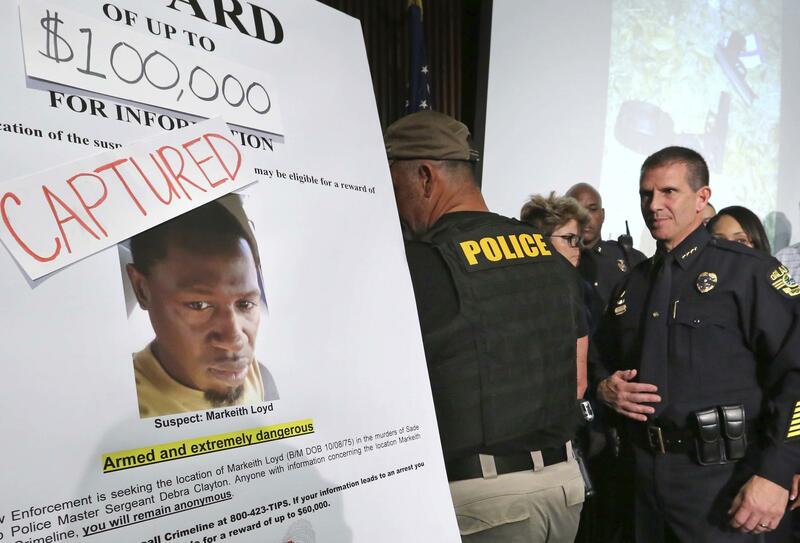 Hundreds of officers and deputies had been searching for Loyd, and a $100,000 reward was being offered for information that leads to his arrest. The U.S. Marshals Service had added Loyd to its list of most wanted fugitives Tuesday and added $25,000 to the reward offer. Published: Jan. 17, 2017, 4:33 p.m. Updated: Jan. 17, 2017, 8:25 p.m.